Average score changes between 2010 and 2014 in NEEP at grade 8 by subject. To view the full report, go to NationsReportCard.gov. The National Center for Education Statistics, which administers National Assessment of Educational Progress (NAEP, also known as the Nation’s Report Card), recently announced that overall academic performance of eighth-graders in U.S. history, geography and civics has remained unchanged since 2010, though Hispanic students have made gains in U.S. history and geography. 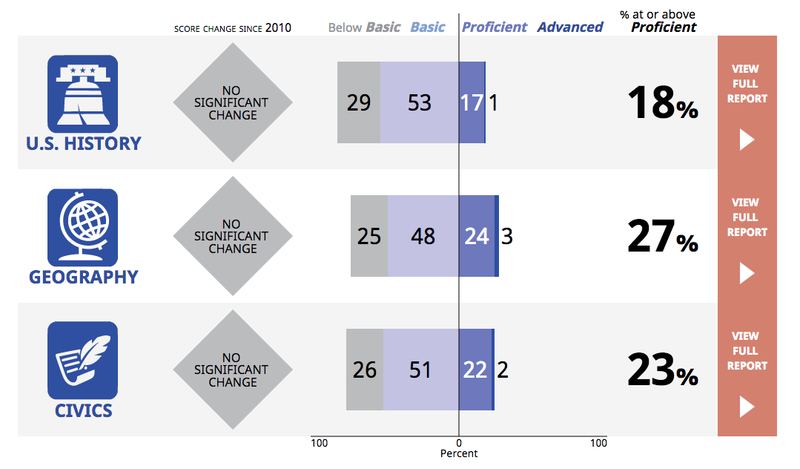 NAEP reports performance using average scores and percentages of students performing at or above three achievement levels: Basic, Proficient and Advanced. The Basic level denotes partial mastery of the knowledge and skills needed for grade-appropriate work; Proficient denotes solid academic performance; and Advanced represents superior work. The assessment is based on nationally representative samples of more than 29,000 eighth-graders in total across the country. What are the basic principles and critical assumptions of American constitutional government about the sources of political power and the rights of individuals? What primary documents include these commonly held civic ideas (for example, the Mayflower Compact, Declaration of Independence, Federalist Papers, Constitution, Bill of Rights, Seneca Falls Declaration of Sentiments, and “I Have a Dream” speech)? How and why has the standard of living for most Americans changed over time? What ideas, values, and practices (for example, individual entrepreneurship, private ownership of property, laissez-faire economics, free enterprise, monopolies, and government regulation) contributed to the development of the American economic system? What types of labor systems developed and how did they influence society and the economy? What were the causes and consequences of key events that marked American involvement in world affairs? The Spanish-American War? World War I? World War II? The Marshall Plan? The Cold War? Globalization? What were some of the political ideas, institutions, and practices of American Indians, Western Europeans, and West Africans before 1607? How did these ideas influence colonial American settlements? What was daily life like in colonial America for the yeoman farmers, merchants, artisans, planters, indentured servants, slaves, and American Indians? How was life different and how was it similar in New England, the mid-Atlantic, the South, the West, the Spanish Southwest, and French Louisiana? What ideas, values, and practices caused the Hamiltonian-Jeffersonian debate over the formation and direction of the nation’s economy? What were the results? How did Harry Truman respond to Soviet military challenges in Europe and Greece? How did Dwight Eisenhower respond to McCarthyism and the Brown decision? How did John F. Kennedy respond to the Cuban missile crisis and to the civil rights movement? This entry was posted in Cultural diversity, Historical interpretation, History, Resources and tagged National Assessment of Educational Progress on May 6, 2015 by Max van Balgooy.